It’s almost as if mother nature created strawberries just for Valentine’s Day. They’re the perfect reddish pink color, a delicious sweet treat all on their own, and they’re even shaped like hearts. 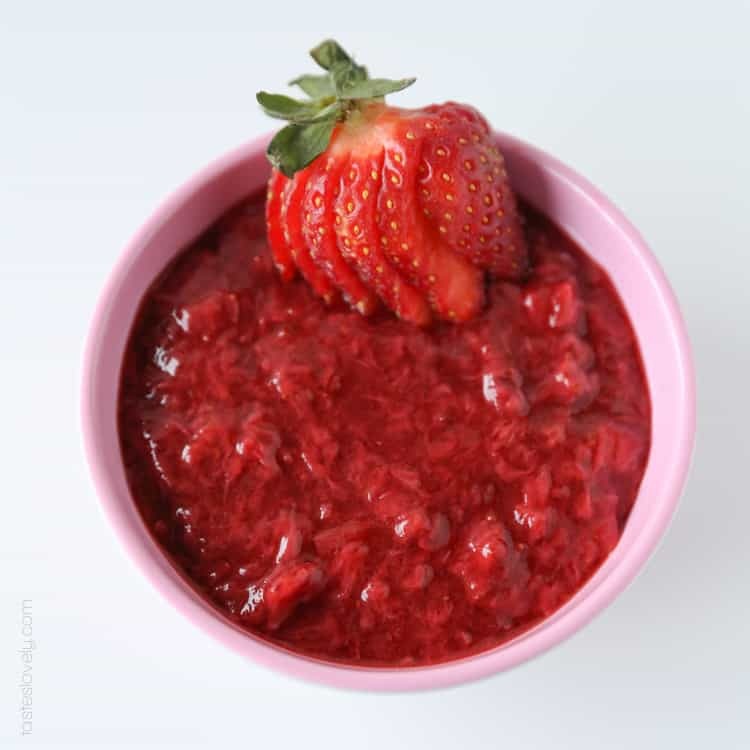 Just wait until you taste the intense strawberry flavor in this homemade strawberry sauce. Just barely sweetened with sugar, and brightened up with a hint of fresh lemon juice. 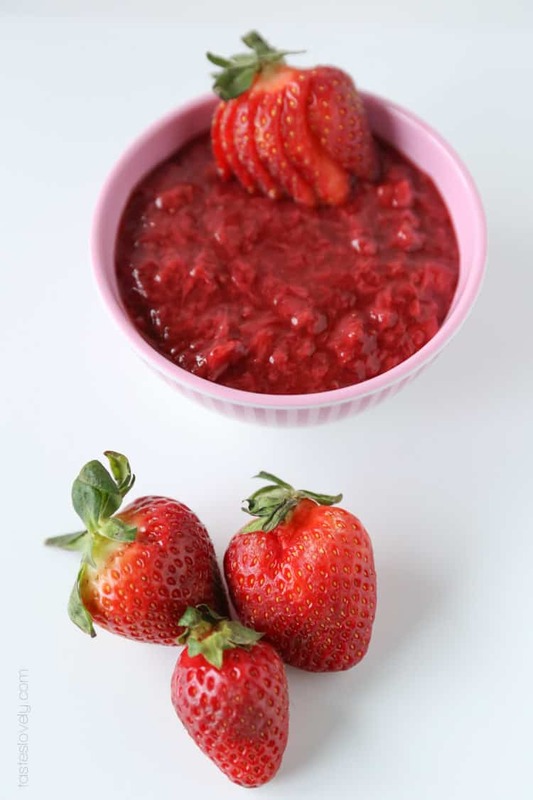 This strawberry sauce is a delicious topping for just about anything. I’ve used it on top of vanilla ice cream, yogurt, pancakes, waffles. I’ve even stirred a little bit into lemonade to make strawberry lemonade. But my favorite would have to be on top of cheesecake. It is easy to make, and your home smells delicious as it slowly simmers away on top of your oven. 1. In a small sauce pan over low heat, add in the strawberries, water and sugar. Stir to combine. Leave simmering uncovered for 15 minutes. 2. After 15 minutes, smash the strawberries with the back of a wooden spoon to break them up. Continue simmering over low heat for another 15-30 minutes, until desired thickness is achieved. After it is done cooking, stir in the lemon juice. 3. You can serve warm or cold. Will keep in an airtight container in the fridge for 2 weeks, and can be frozen for 1 year. This can be made with frozen strawberries as well. Just start off with 1/8 cup of water, since moisture will come off the frozen strawberries. Add more water if needed. Thanks so much Ashley! I kind of thought of you when I was posting it because of the pretty pink color. I definitely snuck a few little spoonfuls when photographing this. 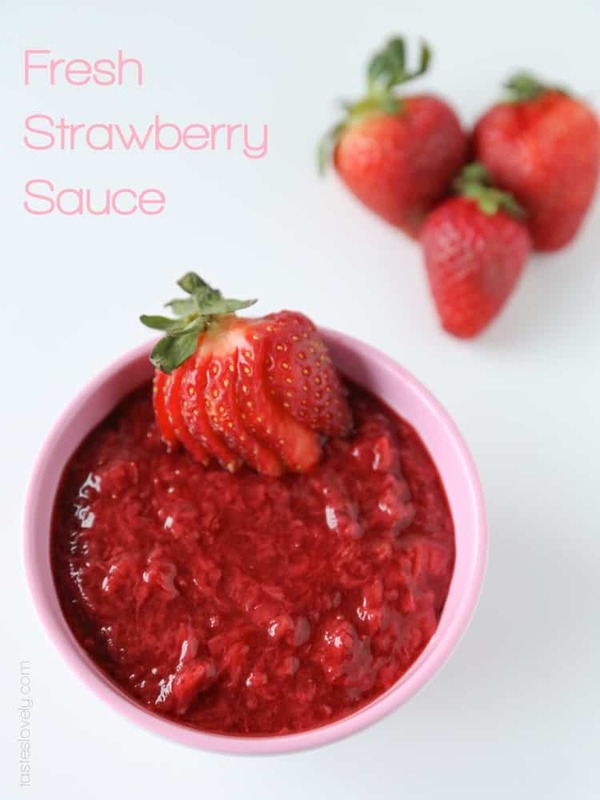 Such a pretty strawberry sauce—I love fresh strawberry sauce over just about everything! Awesome that it’s so easy as well! pinned. Yum! I love this simple recipe. Way to get back to basics :) I think I’ll take this with a spoon. Oooh, strawberries — they go with just about everything! This sauce looks amazing. Thanks Meg! This sauce is great on so many things. I can’t get enough of it. It is super good mixed in with yogurt. I especially love it with greek yogurt and a little granola. Such a good little breakfast. I’ve had strawberries on the brain this month! Valentine’s Day + strawberries. They just go together. This sauce looks amazing, and what a great idea to stir it into lemonade. Flavored lemonades are refreshing treats! Strawberries and Valentine’s day totally go together. They’re like 1 in the same. It is super yummy in lemonade. You just need a little spoonful. Turns it a really pretty pink color too. I never even thought of crepes Irina! What a great idea! Now I want to make crepes with this sauce and whip cream this weekend. Yum! This is making me wish for warmer weather. Gorgeous! Raspberry sauce is great too! If only raspberries weren’t a million dollars this time of year. Can’t wait for spring until I can make some! Hi Natalie! I recently starting following you after your Jessie b take over!! You have great recipes. I was hoping to make this for my kids coconut yougurt, can you substitute honey for sugar? Thank you so much for following along on Instagram! Love having you! You can absolutely substitute honey for the sugar. Or maple syrup, or coconut sugar. I personally love it with maple syrup the most. Will be delicious on coconut yogurt. Yum!